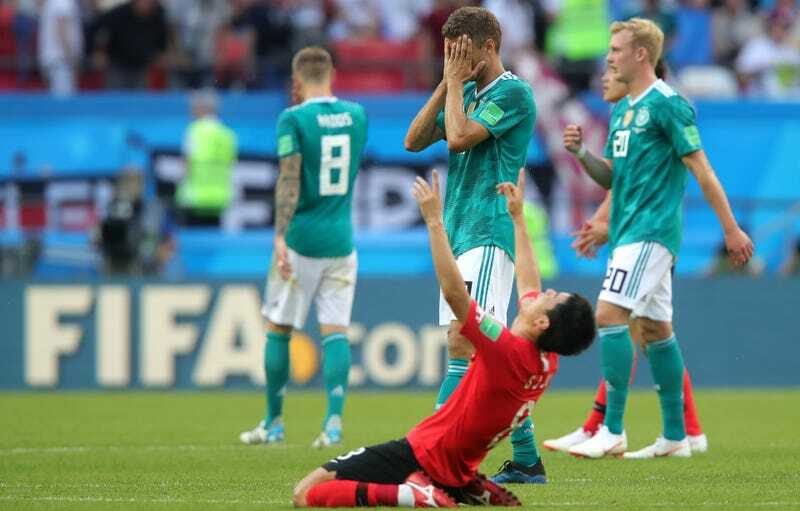 Germany, the reigning champions of world soccer and one of the three huge favorites to win this World Cup, have been knocked out of the tournament at the group stage for the first time in history after losing to South Korea by a score of 2-0. This is absolutely insane. Pretty much all Germany had to do to make it out of the group was beat South Korea, on paper the worst team in their group. Even a draw would’ve seen them through depending on what happened in the Mexico-Sweden game. But Germany looked tired and played sloppy for most of the match, and when Sweden went up on Mexico, Germany couldn’t shake themselves out of their malaise. They created a few decent chances towards the very end, but the crucial goal never came. Their best chances tended to fall to the German players least equipped to score them. While Germany were pushing men forward in all-out attack, South Korea had tons of open space behind the defense to break into on counterattacks. The Koreans had numerous great opportunities to steal a winner on the counter in the last half hour or so, but either the final pass wouldn’t be good enough or, if the ball did get to a player in good position to score, he would wait too long to shoot and the window to score would close. The goal was originally called off for offside, but the ref consulted the video replay and the Korean goal was correctly given. Thus ends Germany’s 2018 World Cup, which was a disaster from start to finish. They lost to Mexico in the first match of the group stage in what then appeared to be the biggest upset of the opening round. They followed that up by playing terribly against Sweden, and only a staggering feat of skill on Toni Kroos’s part stole them a late win that kept their hopes of advancing alive. And they saved the worst for last, somehow losing—and deservedly so—against South Korea. Instead of winning the World Cup like they did last time, Germany have finished last in their group. Every non-German soccer fan has to be ecstatic over this result, as it is a delicious helping of that spectacular German word, schadenfreude. Though if one fanbase is savoring this more than any other, it’s probably the Brazilians.